What if you could combine the agility, adaptability, and cohesion of a small team with the power and resources of a giant organization? THE OLD RULES NO LONGER APPLY . . . When General Stanley McChrystal took command of the Joint Special Operations Task Force in 2004, he quickly realized that conventional military tactics were failing. Al Qaeda in Iraq was a decentralized network that could move quickly, strike ruthlessly, then seemingly vanish into the local population. The allied forces had a huge advantage in numbers, equipment, and training—but none of that seemed to matter. TEACHING A LEVIATHAN TO IMPROVISE It’s no secret that in any field, small teams have many ad­vantages—they can respond quickly, communicate freely, and make decisions without layers of bureaucracy. But organizations taking on really big challenges can’t fit in a garage. They need management practices that can scale to thousands of people. General McChrystal led a hierarchical, highly disci­plined machine of thousands of men and women. But to defeat Al Qaeda in Iraq, his Task Force would have to acquire the enemy’s speed and flexibility. Was there a way to combine the power of the world’s mightiest military with the agility of the world’s most fearsome terrorist network? If so, could the same principles apply in civilian organizations? 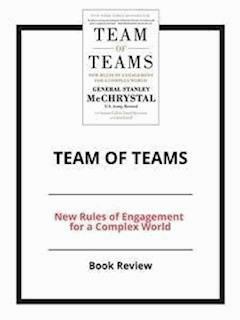 A NEW APPROACH FOR A NEW WORLD McChrystal and his colleagues discarded a century of conventional wisdom and remade the Task Force, in the midst of a grueling war, into something new: a network that combined extremely transparent communication with decentralized decision-making authority. The walls between silos were torn down. Leaders looked at the best practices of the smallest units and found ways to ex­tend them to thousands of people on three continents, using technology to establish a oneness that would have been impossible even a decade earlier. The Task Force became a “team of teams”—faster, flatter, more flex­ible—and beat back Al Qaeda. BEYOND THE BATTLEFIELD In this powerful book, McChrystal and his colleagues show how the challenges they faced in Iraq can be rel­evant to countless businesses, nonprofits, and other or­ganizations. The world is changing faster than ever, and the smartest response for those in charge is to give small groups the freedom to experiment while driving every­one to share what they learn across the entire organiza­tion. As the authors argue through compelling examples, the team of teams strategy has worked everywhere from hospital emergency rooms to NASA. It has the potential to transform organizations large and small. When the United States went to war in Iraq, everyone assumed the world's most elite and best-equipped army would have no problems wiping out a seemingly ragtag band of radical fighters. Things didn't go to script. It wasn't that the enemy was superior – the battle was being waged in a dizzying new environment. That same complex landscape is emerging today in industries far and wide. When the United States went up against the Al Qaeda in Iraq (AQI), it struggled at first to try and understand what kind of enemy it was fighting. Whereas the US Army, for example, was organized along classical military lines, the AQI had a completely unorthodox structure. Rather than a hierarchy, the AQI was a network of teams of two or three freedom fighters who would use the Internet (especially social media) to publicize their terrorist raids and public executions. Since the AQI had no obvious chain of command, it was impossible for the United States to target anyone influential. (And thus, the US Army claimed about twenty times it had killed AQI's "number three" without realizing in a network, everyone is a number three). Furthermore, to add to the chaos, AQI operatives wore no uniforms, drove the same kind of vehicles as everyone else and could therefore launch an attack and then immediately blend back into the urban landscape. This made fighting them exceptionally hard and nonconventional. 1The Army moved from carrying out large scale operations to small sorties where individual threats were neutralized by teams working out of helicopters often at night. In other words, the US Army tried to become more efficient in how it fought the war. The only problem was every time an AQI team was taken out, the rest of the network reorganized itself almost organically and carried on. Becoming more efficient at an old strategy was no step forward. 2The Army tried to use a "Big Data" approach. They used live video feeds from drones and cameras carried by the troops on the ground to get a better picture of what was happening so an appropriate response could be prepared and delivered. Repeatedly, however, by the time that data was crunched and a response prepared, the battlefield had changed again. Eventually it was acknowledged AQI was operating in a complex ecosystem for which no predictions could be made with certainty. Eventually, the US-led Task Force came to realize AQI's secret sauce was "resilience". Resilience is defined as "the capacity of a system to absorb disturbance and still retain its basic function and structure." This was exactly what AQI had achieved. Even though it lost firefights in Iraq and fielded less capable fighters, the AQI network was able to continue to grow because it could bounce back, adjust and survive. That resilience allowed AQI to outperform a superior Task Force.